Plan your next outing as a Garden tour! Naples Botanical Garden is a wonderful place for friends, groups, and businesses to connect with each other and share a unique experience outdoors! We are currently booking tours for November 1, 2018 through September 30, 2019. Teachers: for field trip information, please visit our Teachers and Students page. For small groups or individuals who would like an introductory tour of the Garden, try one of our daily docent-led tours! No reservations taken. These tours are available first come first served; up to 15 people permitted per tour. Tours begin at 11am from November through April, with an additional 2pm tour available February through April. Just ask a Garden Associate upon arrival! Perfect for any society, alumni club, business group, and more! 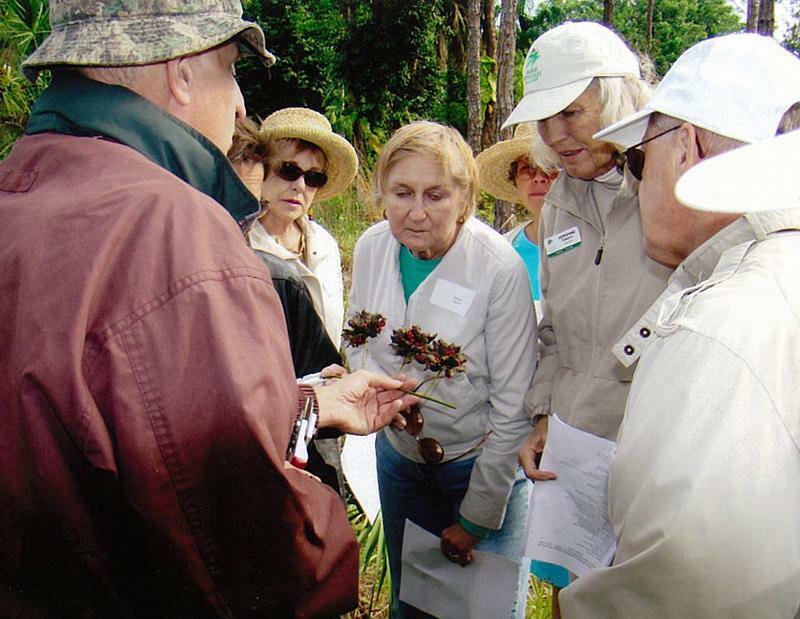 From groups of 10 to 100, a private group tour provides a personalized experience in the Garden. Reservations are required; please see the details below for instructions on booking your next group adventure. 10 or more people qualify as a tour group. Tours are scheduled Monday through Friday. Tours must be booked at least four 4 weeks in advance of requested tour date. To guarantee the date requested, the group tour agreement form must be returned along with your $100 deposit. The deposit will be credited to the tour’s final invoice balance. No tours will be scheduled during special events in the Garden. Final guest count and balance are due 2 weeks prior to the scheduled tour date. Final payment is due 2 weeks prior to your tour date and must be in ONE form of payment, either check/cash/credit card. If payment is received after the invoice due date, a late fee of $25 will be assessed. Garden tour guides are scheduled based on group size. Last minute additions may affect the group’s experience. Extra lunches will be subject to availability. Tours typically last 90 minutes. It is recommended that guests wear appropriate shoes and clothing for active, outdoor walking. The plants in the Garden are growing. They are delicate, valuable, and easily damaged. Never remove vegetation that is attached to a plant or lying on the ground. No part of any plant should be eaten. Avoid unimproved surfaces, including sand. Hand-to-mouth or hand-to-eye contact should be avoided after touching any plant. Should you have an adverse reaction after contact with any plant or organism, alert your tour guide. Plants defend themselves, some leaves and branches have sharp tips or edges. Be aware of your surroundings and don’t walk in plant beds. Use caution! There are overhanging branches and/or obstacles at ground and eye level which can pose a risk to safety. Many places are wet underfoot and can be slippery; watch your step at all times. Trash must be disposed of in the correct marked trash and/or recycling receptacle. Group leaders must stay with their group(s) at all times. Please note that the Smith Children’s Garden is not included with Group Tours. Reservations may be cancelled up to 48 hours prior to the scheduled tour. Groups cancelling with less than 48 hours notice will be charged the full amount. In the event of a no-show, the client will be responsible for payment of the contract in full. Naples Botanical Garden will use the most recent guest count as a final guarantee number. Tours may be cancelled and/or postponed by the Garden due to inclement weather. Should such an event occur, Naples Botanical Garden will provide alternate visit dates and all monies paid will transfer to the rescheduled date.